Once in a while, an idea expands into an enthusiastic vision. At every turn, doors of opportunity open to help that idea blossom. So long ago, this is how Mona's Original Granola amazingly appeared on the grocery shelves of the number one grocery market chain in the southeastern United States. It was one of those home-baked favorites that family and friends enjoyed and asked for again and again. Only this was more than just a tasty recipe. After scientifically researching the maximum nutrient content of various nuts, seeds and grains, the recipe was adjusted. Analyzing the nutritional benefits of high protein all-natural foods, Vitamin E, Iron, Zinc, B-Complex, and high fiber, "Mona's Granola," as everyone called it, became the perfect recipe. Many would agree it was delicious, invigorating and, of course, no added refined sugar was vital! Publix is always exploring unique new products for their customers that no one else has. They gave Mona's Original Granola a chance with a dozen stores to test in St. Petersburg, Florida, near Stetson Law School. When Mona's Granola sold out, Publix began expanding to all the stores in response to steady sales and raving fans. Production grew along with the sales, moving to bigger bakeries to keep up with the requests. New and improved packaging was designed. What began with a glass mason jar and an oval family picture label transitioned to the custom stand-up bags with a clear window so it is easy to see the quality of the actual granola, rather than just an image. Florida visitors who returned home from being in the southeast and shopping at Publix sent hand-written letters requesting mail-order sales. They sent checks to stock up by the case. 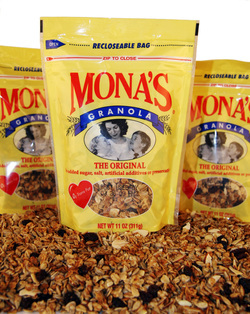 When their local stores didn't carry Mona's Granola, mail-order cases were shipped to California and New York. Now, shipping to all points in between and even England. The playful years flew by with my young sons (pictured on the front of the package) who became accustomed to the granola being part of their everyday lifestyle. It was only after they finished college and began working in the business world that they came to realize this is all pretty "cool." We are all grateful to have the opportunity to provide this natural cereal to you. The best part is the fun has only begun! We are now working to expand our creativity for new products. The ideas are exploding as the boys and I welcome new team members into our "family!"